雕塑藝術 | 藝術分類類型 | 台灣當代藝術資料庫 Taiwan Contemporary Art Archives website. Looking back the development of sculpture in Taiwan since the 1980s we see quite a few changes and significant growth. When the scope of contemporary sculpture is to be enlarged, we must investigate the tracks of such enlargement and continue to compare the relation between the concepts of contemporary Taiwanese sculpture and contemporary western sculpture. Local Taiwanese sculpture inevitably would be influenced by western art. The western minimalism has been included into the aesthetics of sculpture since the 1960s, and from 1967 to the 1970s Bruce Nauman’s camera in the studio recording his performance was his attempt to challenge the boundaries of sculpture. Mary Miss’s project Perimeters/Pavilions/Decoys in 1978 that inlaid a structure in landscape changed the ideas about artworks displaying in public sphere. In 1982 Maya Lin’s monument for Vietnam War turned to another direction of monuments from erecting obelisks in memory of the traumatic past. Matthew Barney, an American artist becoming world known in late 1990s, has combined installation, photography, drawing, film and performance in his art and claimed it is sculpture. As the boundaries of sculpture continues moving, we set a starting point at the 1980s and look into the concepts regarding the formation of Taiwanese sculpture developed around this time before going back to the beginning the 20th century when sculpture in Taiwan had been greatly influenced by the western ideas. Religious subjects, figures and monuments have been the themes in both eastern and western histories of sculpture. Recognized Taiwanese sculptors during the period of Japanese occupation were Huang Shui-Tu, Huang Ching-Cheng, Pu Tien-Sheng, Cheng Hsia-Yu. The all had works of religious sculpture, human and animal figures. After the World War, Yuyu Yang and Chen Ting-Shih turned to modern abstract forms from realist figures. 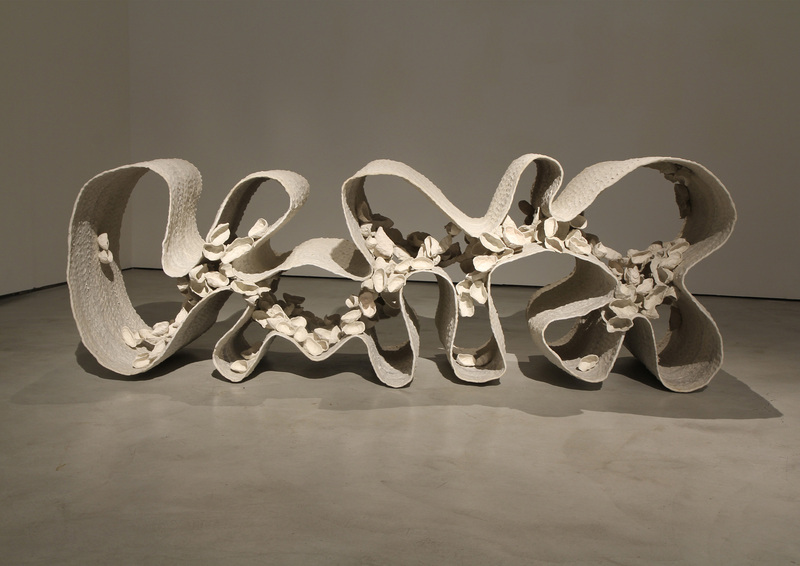 Later Yang Yuan-Tai, Kuo Ching-Chih, Heh Heng-Hsiung, Yang Fong-Zhen, Ju Ming and Lin Yuan transformed figurative sculpture into abstract formal languages for the presentation of materiality. When the Taipei Fine Art Museum was established in 1983, artists nourished overseas or trained locally joined to create a new horizon of sculpture in the 1990s. Since the 1980s and through the 1990s, modern sculpture in Taiwan has gradually transformed toward the extending path of contemporary sculpture. Reviewing its development one can begin with themes, forms, materials, objects or spaces, as well as the specific places for the display. Following the history of each subject we will be able to further discuss the changes of the scope and concepts regarding sculpture. After stone, metal, wood and ceramic, modern sculpture began to employ multiple materials since the 1990s when artists were more and more inclined to test out on different mediums. Thus it’s no longer effective to analyze contemporary sculpture simply according to its mediums. Here we supplement the diversified development of sculpture in Taiwan since the 1990s in order to talk about the soft sculpture with soft materials, and electrified or mechanized sculpture, as well as installation making use of ready-made objects among other mediums. Meanwhile, the laws of public art enacted in the late 1980s and took effect in 1992 have elevated sculpture into a key role through the implementation of public art, which became a category of art almost paralleled to sculpture. We realized that the definition of contemporary sculpture naturally would have gone beyond the classification based on materials that had been taught in art education right after the World War. A perspective covering the history of sculpture, methods of manufacture, the development of sculptural motifs and figuration, as well as the presentation of materials is necessary. Furthermore, issues regarding time, materiality, dynamism and spatiality must be covered in order to have a comprehensive understanding of the contemporary sculpture. Setting out from the 1980s we trace the changing path of Taiwanese sculpture through documenting individual sculptors’ works, and clarify the connotation carried in the development of modern and contemporary sculpture in Taiwan. Given the introduction above, this database reconstructs the history of modern and contemporary Taiwanese sculpture since the 1980s through documenting individual sculptors. It also redefines the scope, characteristics and concepts of modern and contemporary Taiwanese sculpture under the context of local culture. At the same time it does not overlook the history of western sculpture and the changes of concepts from the past to the contemporary. A comparison is made to outline the unique path of Taiwanese sculpture. With such a framework this database sets up several respects and phases for the inclusion of artists with the purpose of moving toward the following issues that are crucial to the development of sculpture. These issues would lead further nomination of artists for this database and a more complete structure covering art concepts, discourse and artworks would be forming. First, this database resets the concepts and scope of modern and contemporary Taiwanese sculpture according to the themes, figuration, graphics, spatiality, mediums, materials among other particular circumstances since the 1980s. Such an approach definitely would refer to the art system in Taiwan and how it decides the relationship between art and the society. It helps clarify the context for the development of art in Taiwan. Second, it investigates the influence from the West. Referring the turns of Taiwanese contemporary sculpture to the history of western sculpture we will see how it has been influenced in different phases. Third, it attempts to establish a introductory category of Taiwanese sculpture. Setting out from documenting the increasingly diversified works in past and the present, we are able to imagine the possible for the future. All these will become the resources for art criticism, art or aesthetics education, as well as curatorial work.